What is Pay-As-You-Go liability insurance? How do I save money on business insurance? How much is Pay-As-You-Go insurance? What is the ACORD form? Why do I need a certificate of insurance? How much is a per-project policy? What’s the difference between claims made and occurrence policies? Why is my client asking to be a certificate holder? What’s the difference between certificate holder and additional insured? What is completed operations coverage? Why does my client need me to buy insurance? How do I get the right coverage for a contract? Why is my client asking to be added to my insurance policy? What happens if I don’t pay my insurance premium? What is professional liability insurance (E&O)? What is contractor’s equipment insurance? What is commerical auto insurance? What kinds of liability insurance can I buy from Jones? Why is my client requesting a waiver of subrogation? 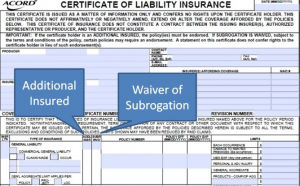 How do I add a waiver of subrogation? Many times, a client requests to add a waiver of subrogation clause to your insurance policy. It can remove potential conflicts between you and your client. To understand what a waiver of subrogation is, we first need to understand what subrogation itself is. Technically speaking, subrogation is the substitution of one person or group by another in an insurance claim, including the transfer of any associated rights and duties. To illustrate: you and your client are involved in a negligence lawsuit together where you are both alleged to be at fault. However, the lawsuit rules that you need to pay for the damages. Your insurance agency covers the damages on your behalf. Subrogation is the right that your insurance has that allows them to sue your client for damages if he is the one at fault. More and more clients are starting to request waivers of subrogation to be added to contractors’ insurance policies. A waiver of subrogation means that you waive the right of your insurance carrier to seek compensation for losses, or sue if your client is also found to be at fault. It prevents your insurance carrier from recovering damages it paid from your client or his insurance carrier. If your insurance company sues your client and he doesn’t have enough coverage, your client will need to pay out of pocket, or his insurance company may increase his premium rate. By requesting that you add a waiver of subrogation, your client wants to prevent your insurance company from suing him for the damages paid. All you need to do is to request the addition to your policy. Your ACORD certificate of liability insurance will indicate if it’s been added to your insurance policy, as you can see below. You may be asked to clarify some details about your services or who is requesting the waiver to ensure that your insurer (i.e. the insurance carrier/provider) understands all the details about the extra risk being undertaken. Get a tailor-made policy without the confusion. What are primary & noncontributory clauses? Still haven’t found what you're looking for? You came with a question we haven't heard before so we'd love to be in touch! Leave your email and your question and we'll get back to you as soon as we can.